← PREVIEW and BLOG CANDY!! Welcome to another SUO challenge! This one was an easy…use some of your NEW SU Stuff! Well…I do have some of that! In case you missed it…I shared a REALLY FUN project using the new banner kit (but not as a banner) in yesterday’s post…don’t miss it! I decided to go VERY simple on mine. You know me…I do like simple. Well some of you might not think it is all that simple because YES…I DID CUT OUT THAT FLOWER!!! VERY FUSSY CUT! But I do have to say…LOVE the way it LOOKS! Kaleidoscope dsp – Cut piece of the Crushed Curry print 4 1/4 x 2. Then add a 1/2 x 4 1/4 piece of the Black and White Diagonal stripe behind it. Add to card front. Take piece of Whisper White and stamp image using Versamark. Black emboss. Cut out (yes…I AM nuts!) and add to card front. I just put glue down the stem. Color in center of flowers using Crushed Curry marker. Stamp greeting on piece of Whisper White 5/8 x 2 3/4 using Versamakr and Black Emboss. Cut in to a banner. Add 1/8 x 4 1/4 Basic Black thin strip behind banner and add to card front. Add Crushed Curry Candy Dots to banner to finish it off. 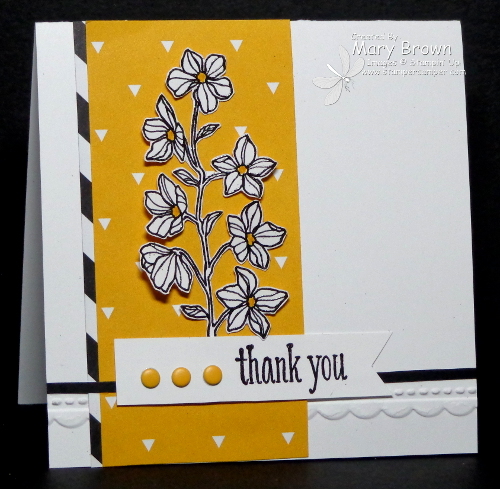 This entry was posted in Clean and Simple (CAS), SUO Challenge and tagged Peaceful Petals. Bookmark the permalink. The fussy cutting was definitely worth it. Love the flowers against the happy yellow background.